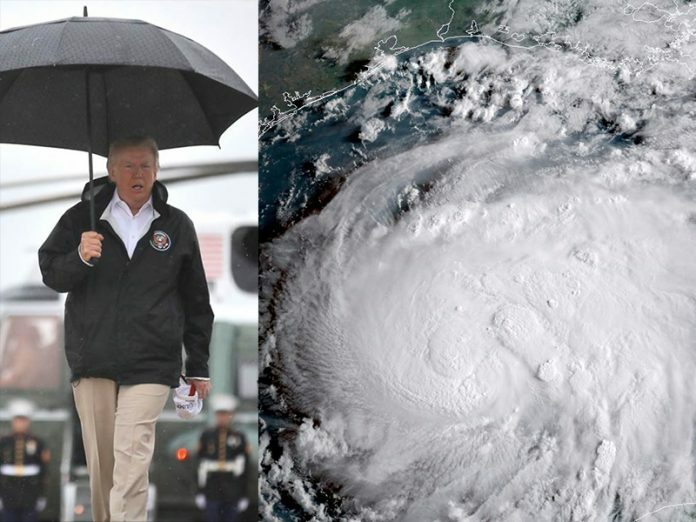 Hurricane Tours Destructive US President Climate elements over Texas get a first-hand glimpse of the active threat to the US mainland, full of tweet-storms. On Tuesday, Hurricane Harvey got a first-hand glimpse of the US President and its destructive path. Houston, TX – The latest Atlantic hurricane got a first-hand glimpse of the destructive leader of the free world on Tuesday, surveying the erratic entity as it flew over Southeast Texas. Clouds above and floodwaters below joined in awe as they witnessed the threatening specimen capable of menacing policy and tweet-storms, make its way across several Gulf Coast counties. As Marine One skimmed the Texas sky, the once Category-4 storm witnessed bright flashes of orange light-up the dark and stormy skies. Unlike events in the past, this Commander-in-Chief is expected to sustain damaging budget cuts well into the next 3 years – revealing its epic magnitude. In a related event, at 12 PM on Tuesday, the “Border Wall Idea” checked in safe on Facebook. The President is expected to makes its ways back to the east coast, and strengthen again along the way.